Hi everyone, I hope you are having a great week and yeah it’s hump day! And to my American friends, I wish you a very Happy Thanksgiving! Today’s post is about being a little indulgent and buying something you absolutely love but don’t necessarily have a clue as to what you might wear it for. 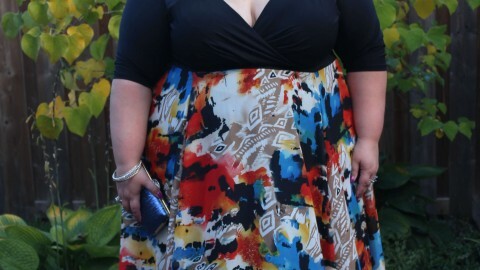 This dress from Torrid came out back in the summer and I was immediately drawn to it. But it’s not exactly an everyday dress and I didn’t have any upcoming weddings, events etc. where I could see myself wearing it. The weeks would pass and as I would take a look at what was new on the Torrid site somehow this dress always popped up on my screen. So when it came time to use some haute cash and it was still available in my size, I just went for it. This dress is super feminine with the cream illusion lace sweetheart neckline, the soft floral print, the satin fabric, the retro fit and flare shape and of course the layer of tulle underneath. I am wearing the size 28 and the fit was perfect. In the last year or so Torrid has started offering semi-formal and prom options and I feel it was a great addition to what they already offered. Especially since they now carry size 10 to 30 and 00 to 6. It is very hard to find an affordable dress for a special occasion and particularly in an extended size range. I certainly wish they were around when I was in high school. I could have avoided all those grandma like options that were out there. The regular price on this dress is only $79 US. And I was able to get it for only $40 US! So although I might not have anywhere to rock this right now I will certainly keep it for an upcoming event. And I sure did have fun twirling around in it the day we took these photos. There is something very Cinderella like about this dress. It may not be the traditional Cinderella blue but it has the aura of something special about it. We shot this inside the Art Gallery of Burlington and it was very busy that day. I couldn’t believe the number of women both young and old that stopped to say how much they loved this dress. When I accessorized this dress I wanted to play up the elegance and sophistication so I added a dramatic earring that picked up on the blue and these rose coloured bracelets from Avenue that picked up on the pink. I then added a simple gold sling back shoe from Fullbeauty.com which also was in the pattern of the dress and this adorable quilted small blue satchel from Kate Spade. I had all of these pieces in my collection already. I love how my mind speaks to me when it comes to the accessories I have, I never know quite what I am going to come up with. I firmly believe that sometimes its okay to buy something that makes us feel great even if we save it for a special occasion, or we just dream about where we might wear it, or we go to the grocery store in it or just twirl around the house in it. Who says that as grown women we can’t enjoy playing dress up like we did when we were little girls? I say go for it! Thanks to Robert of Robert Skuja Photography for capturing this Cinderella moment. Hey gorgeous!!! Loooove this look!! Question, what brand of makeup do you use?? I love that shade of lipstick! Good for you for not passing this up! It is perfection. I love the gold shoes with it.